Lexington, Kentucky was our location for this week's SmackDown as the brand picked up momentum heading towards 17th December's Clash of Champions PPV. The show featured Randy Orton squaring off with Kevin Owens in the main event under No Disqualification rules, with Sami Zayn barred from ringside as The Viper looked to gain revenge on Owens for his involvement in SmackDown's loss at Survivor Series earlier in the month. There was also more depth added to the Women's division as the team of Liv Morgan, Ruby Riott and Sarah Logan, now going by the collective name The Riott Squad stepped in with three of the women they assaulted last week, Natalya, SmackDown Women's Champion Charlotte Flair and Naomi. But was it any good? Let's take a look! The opening segment felt unnecessary and followed the tired pattern that's been seen for months with Shane McMahon skipping out to open the show and talk aimlessly for a bit. Honestly, the job that McMahon did here had already been done in the show's opening video package and him recapping storylines is a waste of everyone's time. The tension between McMahon and Daniel Bryan continued to be played up, but feels a little bit forced at this point. To be honest, there whole conversation felt convoluted and revealed very little information about anything. We did, however, get the news that Sami Zayn would be banned from ringside for Kevin Owens vs. Randy Orton and the match would be No Disqualification. This whole segment could've been boiled down to a short backstage skit, a WWE.com article or just a tweet, with the screen time going to any one of the actual wrestlers. A couple of backstage segments set us up for a good TV main event, with the highlight being Orton refusing to have an interview as he stormed out of his dressing room heading to the ring. The match followed on from there with The Viper looking extremely motivated and bringing the fire in Lexington as he dominated Owens from the bell. Whilst the reasoning for Orton's anger (Owens cost SmackDown an Elimination match at Survivor Series) is lame, Orton's aggression and physicality sold just how pissed off he was with the former Universal Champion. 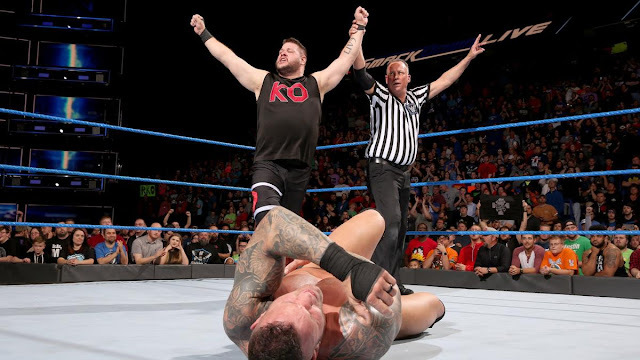 The two made good use of limited number of weapons, with a number of heavy kendo stick shots and a cool moment when Orton was reaching for the foreign object whilst in a headlock, only for Owens to release the hold, grab the weapon and batter Orton with the stick himself. 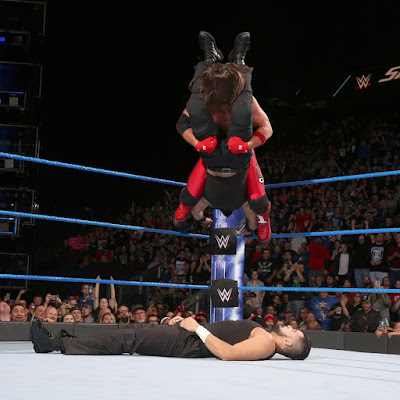 It was the physicality that drove the match, with lots of brawling on the floor and spots involving the barricade and announce table, but there was also a handful of crisp wrestling sequences, with Orton's snap scoop powerslam standing out in particular. Whilst the two brawling towards the entrance ramp felt contrived, Sami Zayn's involvement (he was only banned from ringside) was obvious and Zayn's chair shots to Orton's thigh were two of the weakest in recent memory, they played an important storyline role in the finish of the bout. 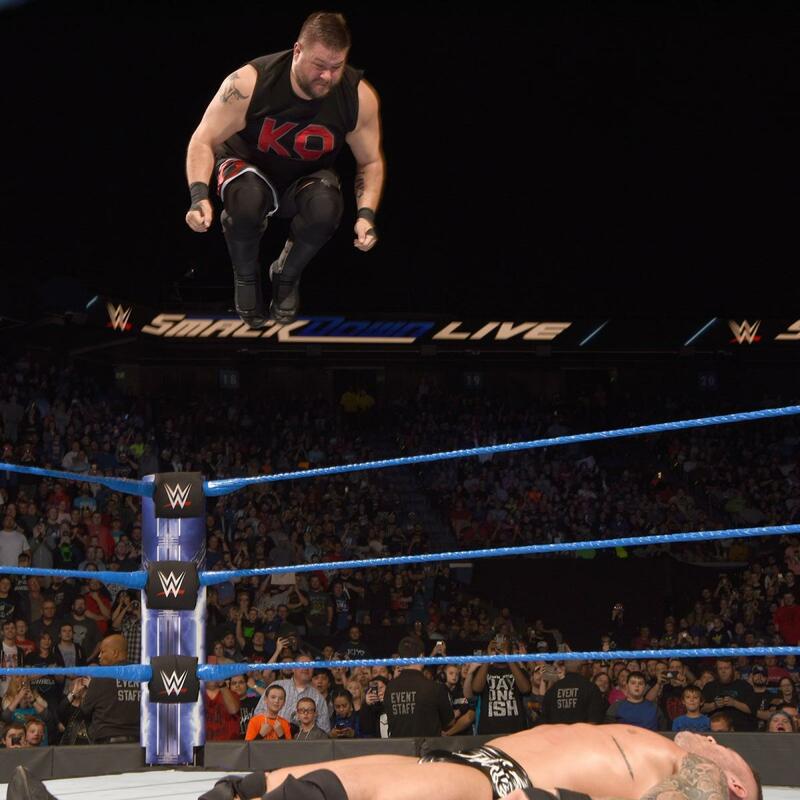 Orton was unable to hit the RKO, due his plant leg being injured, before a shot to the injured leg, a superkick and a frog splash gave Owens a big pinfall victory. For the length of the match, they perhaps could have worked a few more convincing near falls into the action and maybe one or two more weapon spots (the crowd wanted tables, dammit), but this was still a very good main event. Where both men slot into Clash of Champions I'm unsure. One of the most impressive female debut matches in quite some time as newly christened Riott Squad ripped apart the thrown together trio of Natalya, Charlotte Flair and Naomi. Consisting of Liv Morgan, Ruby Riott and Sarah Logan, the group took out their opponents one by one and took very little offence in return, against the last three SmackDown Women's Champions. Natalya ducked out of the bout after a physical clash with Logan, before Morgan and Logan would dismantle Naomi at ringside whilst Riott controlled Flair inside the ring. I have to say that at points the match felt a little flabby, seemingly unable to decide which highspot on Naomi looked better and doing all three and also taking a little while to transition from that attack to the group finally putting Flair away. Whilst, the Riott Squad have a long way to go in perfecting their act, the presentation of the group was spot on here, as they looked different from pretty much anything that's been promoted with the blue brands females up to now. The promo from Riott before the match also did a quality job of getting over her character and relationship with Morgan and Logan, with the former CHIKARA Young Lions Cup Tournament Champion showing bags of personality. It's an easy comparison to make but the Riott Squad's segment this week was head and shoulders above what was done with Absolution on Raw the previous night. AJ Styles did an avalanche Styles Clash in WWE. 2017 is freaking spectacular. Fair play to whichever one of the Singh Brothers took the move (coming off the middle rope onto his brother! ), with the move coming off a super safe. The match itself did a pretty good job of positioning Styles as the underdog against a pair of lads who have at best been presented as fall guys for Jinder Mahal throughout their run. Styles got sent under the bottom rope and ribs first into the ringpost in a pre-match attack from Mahal, Sunil and Samir, with the Phenomenal one selling the injury well throughout as he fought from underneath against the former GFW Tag Team Champions. After the match, Mahal finally dumped the men who had allowed him to remain the WWE Champion for six months, hitting both brothers with the Khallas. Where this will go in the last two episodes before Clash of Champions, I'm not sure, but I'd be up for a Singh Brothers run in the tag team division if nothing else. Side note: Mahal's legs look like those of another man. A solid tag team opener here, even if the result is a strange one. 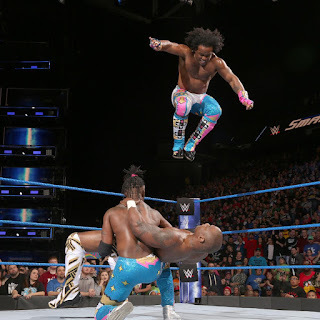 The bout was a relatively basic two on two, with Woods working the face in peril role, a couple of underhanded tactics from Shelton Benjamin and Chad Gable, before a Kofi Kingston hot tag. The match was elevated by a wonderful sequence between Kingston and Benjamin that went back and forth at pace with a number of crisp reversals. The two have history from their time on ECW together, as well a fair few house show singles matches, so I got a kick out of seeing them go at each other full pelt. The match paced itself well with a hot finish seeing Benjamin taken out with a tope conhilo from Woods, before a wicked version of UpUpDownDown put Gable out. 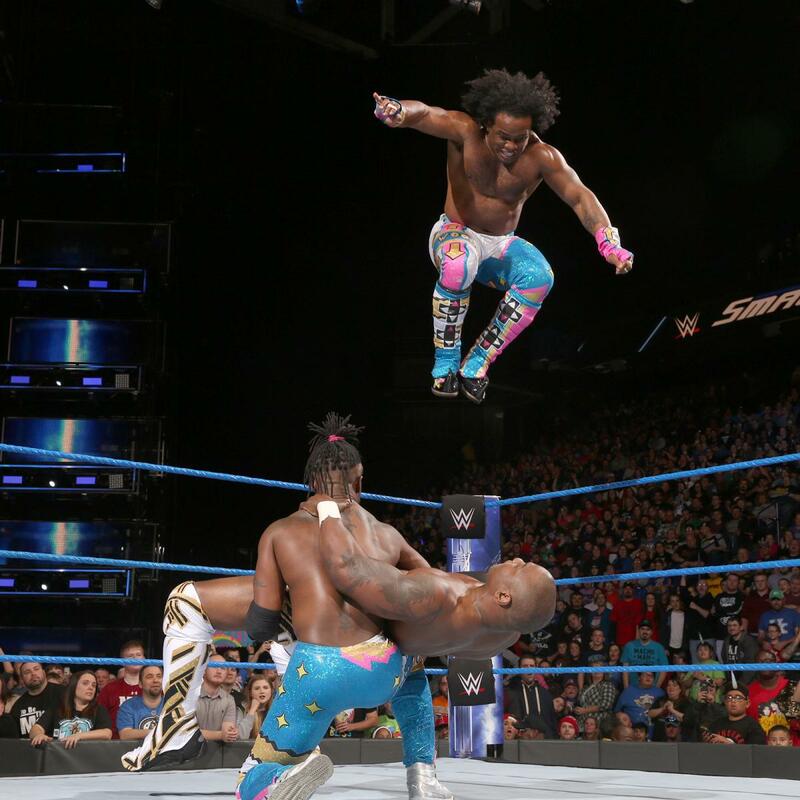 It was an odd decision to have Benjamin & Gable lose here, as they had previously been in a feud with SmackDown Tag Team Champions The Uso that included Benjamin beating Jey Uso last week, whilst New Day have had repeated matches with the champs for quite sometime. Perhaps, WWE is positioning for a triple threat at Clash of Champions, but it's come completely out of the blue. An even swifter squash match for Rowan and Harper as they knocked Mojo Rawley off the apron and ran through Zack Ryder in under a minute with a double crucifix powerbomb. In a dramatic post-match angle, Rawley turned on Ryder during an interview with Dasha Fuentes, before later telling Kayla Braxton backstage that "the landscape has changed"
The Fashion Files returned with one of their better episodes in the last few months, as they parodied the Saw franchise and The Ascension apparently died. Interrupting an interview with Dasha Fuentes, Baron Corbin claimed he was not scared of Bobby Roode, so Roode challenged him to a United States Championship match later on in the show, but Corbin refused. After we got past the opening segment, this week's SmackDown was an entertaining show and whilst nothing was a homerun, there was a lot of second and third base attempts. The two top matches with Owens vs. Orton and the Riott Squad vs. Natalya, Flair and Naomi delivered with plenty of physicality, only being hurt by being slightly bloated at points. The undercard was also solid stuff. 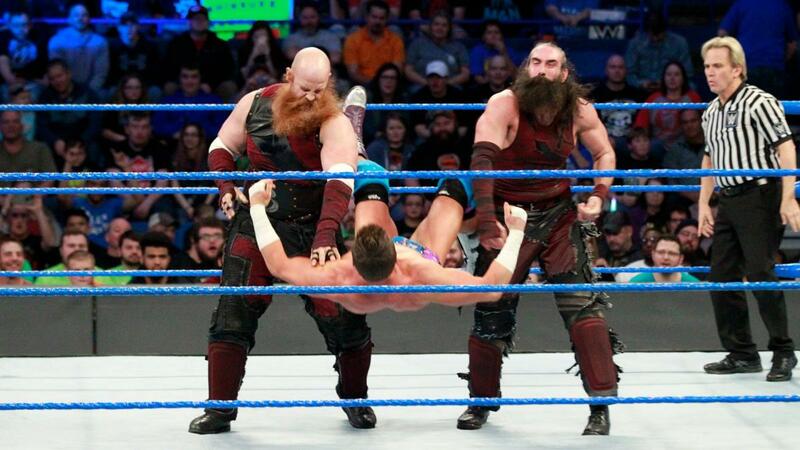 AJ Styles' handicap match was booked well and included an avalanche Styles Clash, the New Day vs. Gable & Benjamin bout featured some delightful action, whilst the Bludgeon Brothers looked impressive and Rawley turning on Ryder bought some intrigue to two guys that had been treading water for months. There was also a return to former for the Fashion Files! SmackDown 954 gets a thumbs up from me.